At first I was distracted by the actual child--a free-range toddler--crawling into the IDSA booth in this pic, but then the bamboo/ply-looking, bassinet-looking piece of furniture in the right corner caught my eye. Or maybe it's really just a large sewing basket for cap-knitting snowboarders? 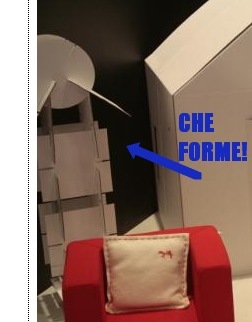 The sweet, sweet trapezoidal cardboard house goodness that Nume Design showed in Milan doesn't show up in this photo, but hey-ho, what is that slot-together cardboard toy? It's like the Eameses' The Toy and a giant, drawable, recyclable version of those old Crystal Climbers we used to pretend were Communion wafers. Drove the Mormon parents crazy. Anyway, if you see something--or post something--say something. Throw a link into the comments for any pics or posts of cool kid-related sights at ICFF or any of the other Design Week events. update: here's the first one. Core77 has a video demo of Age Design's HiLo kid's chair, which flips over from infant high chair to toddler/kid booster chair height. Age Design is a husband-wife design duo from Montreal: "Tired of shopping for poorly designed products...it was in November 2005, when son Arthur was born, that Patrice Guillemin...made his first sketches of the HiLo chairs..."
update update: Swiss Miss loves the Nume booth, too, but for their little cardboard oven, and for their toddler bed that's shaped like an inbox. Swiss Miss also spotted the Roller Buggy, Valentin Vodev's Maxi-Cosi/scooter mashup, which was also at 100% East in London last fall. Watch for the CPSC recall in 2019. Hey! Thanks for the linkage! 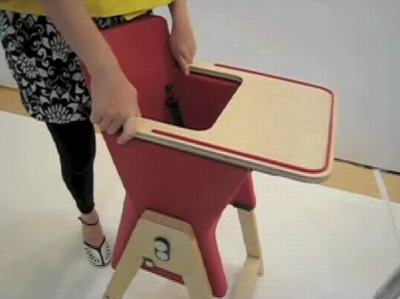 Did you get to see the YiAhn Bassinet at ICFF? I am completely gaga over it.